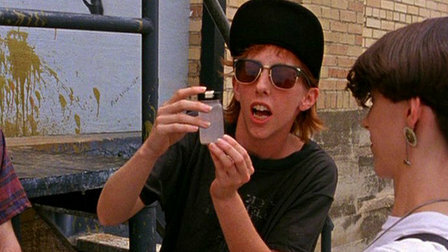 Slacker is far from Richard Linklater’s best film. As a patchy collage of Austin freaks and weirdos, Slacker can best be described as a very good student film. As I have said before, directorial debuts should be analyzed less for quality and more for promise, and Slacker showed that Linklater had the rare ability to string together an entire film out of conversations rather than plot points. Some parts of the film drag on, and other parts are fascinating, depending on whichever character he is focusing on at any given moment. Boyhood might have been in the making for 12 years, but once you see Slacker, you will realize that he was building towards it for his entire career. Birdman was partially a response to everybody who criticized Inarritu as a self-serious hack. Self-serious? Sure. Hack? No way. Babel split critics apart when it first came out and it is mostly forgotten today. That is a real shame because to me, it is what Crash might have been if it didn’t try so hard to have a simplistic message. With its subtlety overlapping narratives and globe-spanning story, Inarritu has always shown that he is up for a challenge. There is simply not enough hours in the day to talk about The Royal Tenenbaums. Sure, it is not as epic in scope as The Grand Budapest Hotel, but to me it is still his masterpiece. I emphasize “me” because everybody has a favorite Wes Anderson film that they are willing to fight for. Like Grand Budapest, Tenenbaums is about a shut off world of wonder that is slowly creeping towards the bleakness of reality. The Tenenbaums are one of cinema’s greatest dysfunctional families, and by the end their story is a strange sort of uplifting tragedy. The Royal Tenenbaums is the kind of film you don’t forget about quickly. It has an amazing soundtrack (worth buying) that ranges from Nico to The Clash to Paul Simon. It will have you yelling “that’s the last time you put a knife in me!” at your friends and family for basically the rest of your life. Allow me to be unprofessional for a moment: who is this guy? I don’t think anybody was expecting Morgan Turnpike to get a nomination for The Imitation Game. I still haven’t seen The Imitation Game (review to come), and while I have heard good things, this nomination still surprises me. Mortimer Tylenol is not a household name, but perhaps his name is one we will have to get used to saying. Not to degrade him at all, because I am sure that Miriam Tiger knows what he is doing, but I feel like a certain Hollywood wizard (*cough* Harvey Weinstein *cough*) may have pulled some strings here. Note: If you have actually seen any of Martin Temper’s films, please let me know what I am missing in the comments. *No I was not friends with, nor did I ever meet, Philip Seymour Hoffman. We are on a first name basis in my head. Headhunters by Morten Tyldum is actually a pretty good movie. It’s on Netflix.